I’m Orangewaterbaby and this is my blog. 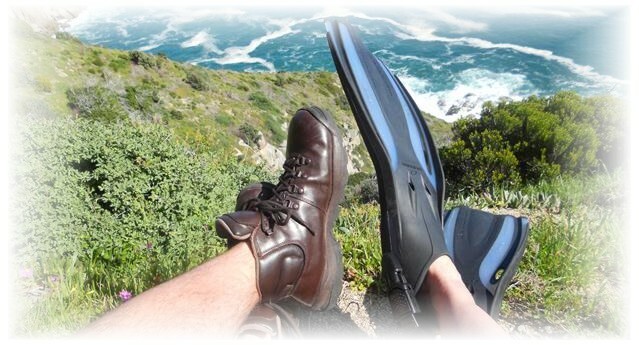 I am lucky to live on the stunning southern tip of Africa between the mountains and the sea, hence the need for boots and fins. In the words of Martha and the Muffins, “From nine till five I have to spend my time at work, my job is very boring I’m an office clerk”. But then it’s time to get out! And that’s what this blog is about. Hubby for the last 15 years and counting, best friend, protector, pathfinder, dive buddy, fitness coach (he tries…), financial guru, sounding board, tech support, endlessly patient (see “My foibles”) the list goes on… Every girl should have one of these! Snakes, scorpions, spiders – bring ’em on! If I were on Fear Factor I’d be the one eating the mushy bug. But I do have a few foibles that seem inconsistent with an enthusiastic hiker: I have an irrational fear of heights or more accurately, exposure (irrational because I managed to do the Mont-aux-sources Chain Ladders in the Drakensberg breaking only a minor sweat while the shorter, sloping chain up the Golden Gate Brandwag had me in tears. Don’t ask, it’s just like that). I also can’t boulder-hop across rivers. Not even small ones. Significant Other has to hold my trembling hand and guide me across. And whilst I’m a mountain goat on the uphills I slow down to a crawl on the downhill. The gist of this is: if I can do it and enjoy it, anyone can! Hi I enjoyed some of your posts. Stumbled across them while searching for some info on Agter Tafelberg hut. I was wondering if you would like to swop links with my outdoor blog – http://www.ralphpina.com? Hi Ralph. That’s great – I have added a link to your blog on bootsandfins. I have read many of your posts over the last few years and I enjoy them as well. And we both support Oranje! Done. We did the traverse from Agter Tafelberg to the Paarl toll gates. What a mission! Never again. Will post about it soon.